Our wines come from three of the best Wine Regions of Argentina: Agrelo and Vistalba in Lujan and La Consulta in the Uco Valley. Our grapes come from small producers committed to sustainability working hard throughout the year to achieve the highest quality grapes. Some of the vineyards that we use are more than 90 years old. 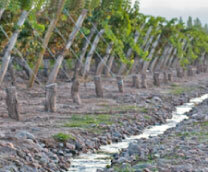 In the vineyards the irrigation is through “surcos” and ditches; water comes from thaw of the Andes Mountains. 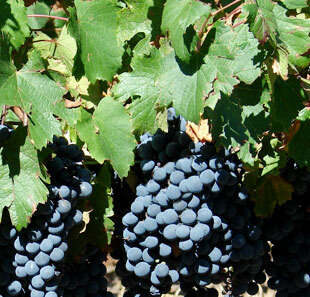 Within Lujan de Cuyo, Agrelo and Vistalba are the most importantareas for the production for super Premium wines.It is located at the foot of the Andes Mountain. The altitude of this vineyards is from 920mts to 1200 mts above sea level with a thermal amplitude between 13° and 14°C. These states have alluvial soil, clay, and boulder; all these characteristic help to achieve well balanced and elegant wines. Located at 80km south- west of Mendoza city, the Uco valley is at the foot of the Andes Mountains. 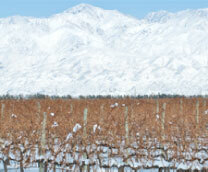 In this area, La Consulta is highly regarded as one of the best areas in Mendoza to produce premium wines. The vineyards altitude range from 900 to a 1500 m. above sea level. Fruity, mineral and long storage wines are the result of thermal amplitude (over 15° degrees) and stony and sandy soils.